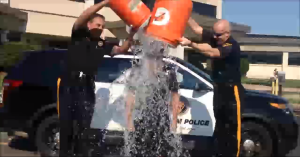 Mayor Randy Brown was recently challenged to do the ALS Ice Bucket Challenge. Brown gladly accepted the challenge and was doused with the ice water. He also donated to the cause on Thursday, Aug. 14. The challenge was made by O.J. Brigance, Director of Player Development for the Baltimore Ravens, who suffers from amyotrophic lateral sclerosis, better known as ALS. O.J. leads the Brigance Brigade, an organization with the mission of encouraging, empowering and equipping people living with ALS. ALS is a neurological disease, which robs a person of their ability to walk, talk and eventually breathe. Currently, there is no cure for ALS. There are 5,600 cases are diagnosed annually with a two- to five-year prognosis to live. Raising awareness of the debilitating disease and making donations that will assist in research are the first steps toward a brighter future and to improve the quality of life. For more information and to learn more or to donate, please visit www.brigancebrigade.org or www.alsa.org. “It’s never too early to act and make a difference. I implore everyone to get a little chilly and make a donation to help fight ALS,” Brown said.